It was a weekday night. I went to a drab meeting room in a neighborhood library to attend a meeting of the College Area Community Council. They were talking about making it safe for cyclists to ride on Montezuma Road. A city traffic engineer was there to present a study, and I had my own report to give: I was hit by a car and nearly killed five years ago as I was riding my bike to work on Montezuma. Bikes are not cars or pedestrians. But up until now the conventional view has been to treat them like cars. Same road. Same rules. That’s been the catch phrase. But bikes aren’t cars. They don’t perform like cars. They aren’t as fast, and above all they don’t have the steel skin that protects the operator. The community council meeting began with the pledge of allegiance and acceptance of minutes of the past meeting. When they got to the presentation of the city engineer, he began by explaining his department’s bureaucratic locus so we’d best understand his function. I stared at my watch, thinking of the two kids I left home alone. Finally, the engineer showed a map of Montezuma Road with car-bike crashes pinpointed (Check out the map above). I saw mine. I also saw the accident that claimed the life of Charles Gilbreth earlier this year. 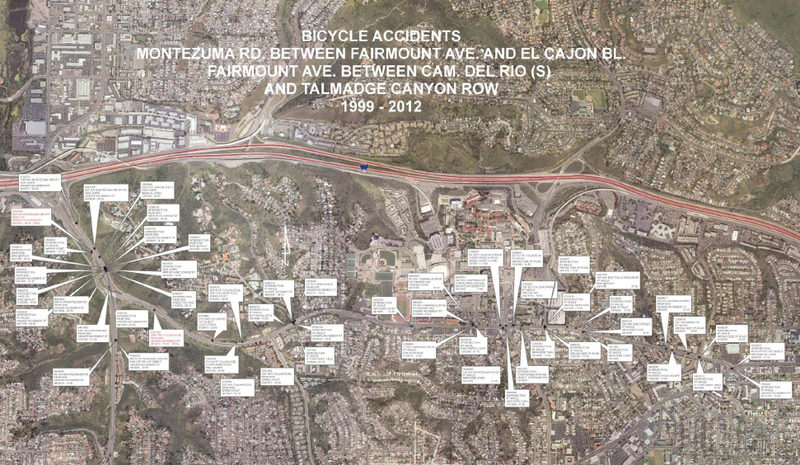 Since 1999, there have been 49 bikes hit by cars on Montezuma Road. Two of those crashes were fatal. There were some people in the crowd I recognized including Jim Baross, a former head of the local bike coalition who once told me cyclists shouldn’t worry about being killed by a car because that would ruin a motorist’s day. It was his clever way of saying bikers shouldn’t be timid about sharing the road with cars. Even then, I didn’t even think it was funny. I used to chastise cyclists who would ride their bikes on sidewalks. It was illegal, after all. But I don’t think like that anymore. I think people on bikes are like pedestrians who need the same kind of protection from cars. That’s at least true of four-lane roads like Montezuma, where traffic moves nearly as fast as it does on freeways. When it was my time to speak to the community council I walked up to the podium at the front of the room. I said the painted bike lanes on Montezuma were a joke. Sharing the road with cars might be fine on a quiet residential street where the cars don’t go too fast, but not on major thoroughfares. I left early to get back to my kids, and we’ll see what comes of it. I was in Germany in the summer where I saw their streets bordered by broad sidewalks that were split into two lanes… one for peds and one for bikes. That’s smart. I wish we would do that here. This entry was posted on November 23, 2012 at 10:10 pm and is filed under Uncategorized. You can subscribe via RSS 2.0 feed to this post's comments. You can comment below, or link to this permanent URL from your own site. Thinking of good ways to protect bikes from traffic, I recall spending winters in Scottsdale, AZ who, like your description of German split sidewalks,, bikes & pedestrians have their own half of the sidewalk . Only problem I can think of with this idea is that the pedestrian had better keep an eye peeled because people riding bikes can come up on a person quickly, and one had better be on the correct side of the sidewalk! However, such a plan would be fine for our city. I agree.